Our head office is located at Stapylton on the Gold Coast. We supply tanks to the South East Queensland region. Where can I purchase tanks? You can purchase via our online store or place a direct order by contacting us on 1800 677 003 or emailing – craig@nationalplastics.com.au. Do your tanks have seams? No all our tanks are seamless in construction with a smooth wall design for maximum strength. Do your tanks require center poles for roof support? No all our tanks have an engineered roof that is self supporting. Will algae grow in the tank? For algae to grow in the tank there has to be sufficient light in the tank, with the strainer in place there is not enough light to allow algae to form. What makes your tanks the best? Most manufacturers are using the same food grade material as per the standard. The difference comes down to design and manufacturing process. Unlike others we have never had a tank split or burst ever! What is included when I buy the tank? Every tank comes complete with inlet strainer, meshed overflow, brass bsp outlet and tap or gate valve. Do dark coloured tanks make the water Hotter? There is little difference if the tank is full of water. Can the tank be damaged by fire? Small grass fires will cause minimal damage, possible scorching or blackening. However large fires will Destroy any tank. Most local councils support the saving of water and the installation of tanks. The requirement for council approval varies between local government areas and you need to consult with your local government authority for approval processes. What is the warranty on my Rainwater Tank? Your Tanks R Us Water Tank comes with a 10yr manufacturer’s warranty. 1. You can call us on 1800 677 003 and we can process your Mastercard or Visa securely over the phone. 2. We also accept cheques. How long will it take before my tank arrives? Once your order has been processed, we will endeavour to make sure your tank is delivered to the property within 2 weeks. Do you install the tanks? No we don’t. Installation should be done by a Licensed Plumber. Are there any special requirements for installing a tank? My colour is not listed on you colour chart? Designers are always updating their ranges with new and improved colours. Please contact our office on 1800 677 003 for further information. You can calculate this quickly by knowing your roof area and how much rain has been recorded for a given period. Simply multiply your total M2 of roof area by your annual rainfall average and you will have a total potential catchment for the year. Do I need to connect to mains water? When using your tank water for the house, most councils require that you install a mains connection kit. How this works is when the tanks get low, the system will top up automatically from the town water supply. Can I choose the colour of my tank? Yes. You can select the colour of your tank. Please note the colour options below. 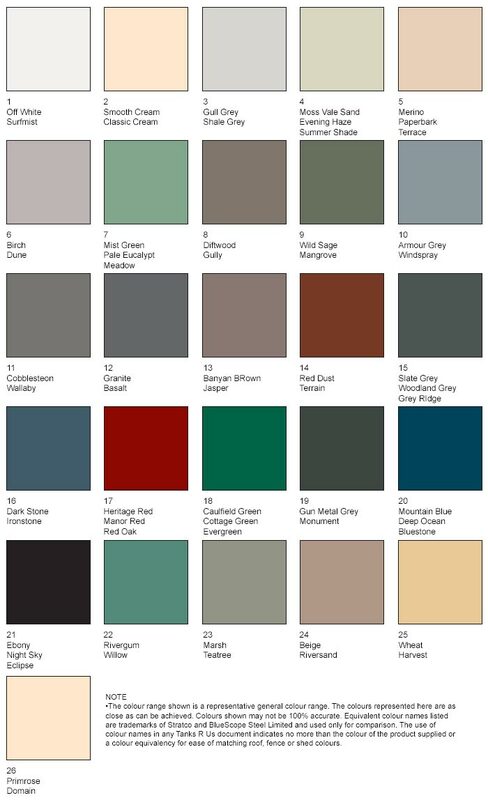 If the colour you want is not listed please contact us.